When we do ethnography on the road, we constantly encounter visual evidence that bears upon so much of the theoretical jargon we wrestle with in seminars, be it challenging or reinforcing. 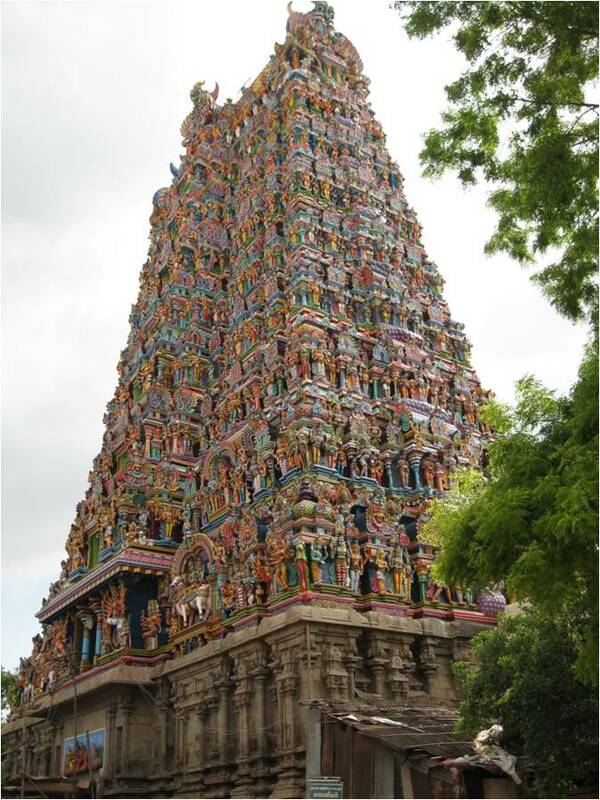 Take, for example, the iconic Tamil temple tower (pictured above). Easily evoked in any traveler’s mind who has visited Tamilnadu, the “ornamental” nature of its architecture fades upwards and into the heavens. Structurally, that is, it steps upwards, climbing higher into the sky. I deploy the term “ornamental” here in the sense intended by Seligman & others, referring to a form of repetitive patterning used in pre-modern structures. “Repetition,” they write, “is central to the very nature of ornament.” (148) The function of this repetition, they postulate, begins to organize and shape reality, structuring how human beings perceived the world. “Ornament repeats, and through this repetition, imposes order on the cosmos…” (148) The temple complex is thus also marked with cosmic hierarchies spreading horizontally – visible to people of all castes, though only Brahmins and upper castes may make their way inward, and thus are able to perceive, the innermost sanctum. Similarly, such Gōpurams are also indices of a different kind of religious architecture – one that straddles the threshold between gross and subtle representations of the divine. Gōpurams also depict a coarse manifestation of a subtle form of divine life. Gaily colored, they are visually contrasted with the deity’s image in the inner shrine. The inner deity is made of black granite in Tamil temples and facial features and individual characteristics are often hard to make out. In Shiva temples especially no physical characteristics are carved but rather a linga (self-born representation of Shiva) remains, untouched by a sculptor’s hand. Gōpurams on the other hand are brightly colored and repainted regularly to enliven their facial features. They remain as an objectification of that subtle form, because of its stark visual contrast to the inner, dark, sanctum image. This dichotomy also replicates the diversity of philosophies within Hindu religious traditions that argue for the forms (svarupa) or formlessness (virupa) of god/s. The indescribable, formless, and hidden divine is manifested in brightly colored figures on the outside but however only roughly representative of the root deity in the inner sanctum. This entry was posted in Deeksha Sivakumar, South Asian Studies and tagged architectual ornaments, ethnography, Gopurams, Seligman, Tamil temples, TamilNadu. Bookmark the permalink.